Celebrate the Seville season! The marmalade oranges are here. We all have our favourite marmalade recipe, handed down on a scrap of paper that easily came to hand as notes were quickly scribbled. Or perhaps yours was torn from a weekly magazine the printed words now splattered with juice and sugar and the ink faded. 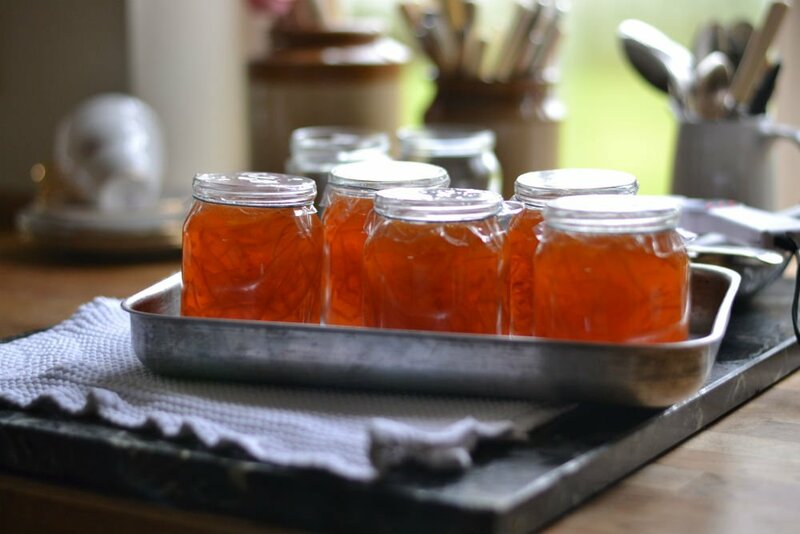 Nothing beats AGA toast with homemade marmalade but save a few jars to add to a sauce, fill a tart or use as a glaze. This recipe was handed to me by Lady Grylls whilst I was delivering an order. My catering company was just becoming established and I loved visiting her Dorset home with a basket full of freshly baked treats. Or she may request I stay for the day to cook a family meal as well as dinner for guests. They lived in an imposing country manor surrounded by beautiful gardens with a gateway that led to church Usually there was a black London cab parked outside, which I understood to belong to her son, Bear. I loved the house as it was always full of noise and activity. This usually came from the hens that had found their way in through the back door to the kitchen beside the pantry whilst the dogs lay silently beside the AGA taking everyday life in their stride! You will need a loose bottomed tart tin lightly greased with butter. 250g (8oz) sweet pastry, make your own or seek out Dorset Pastry. Roll out the pastry to an even thickness of half a centimeter and line the pastry tin ensuring that the dough is pushed gently into each of the flutes of your tin and that there are no cracks. Leave any excess pastry over the edges and allow to rest for 20 minutes in a cool place. Meanwhile make the filling. Mix the eggs, sugar, cream and zest together. If cooking in a conventional oven, trim the edges of the pastry case neatly, prick the base with a fork and line with baking parchment and baking beans. Cook for 25 minutes until the pastry is crisp and golden. Then remove the baking beans and parchment and continue cooking for another five minutes to ensure that the base is cooked through. Reduce the conventional oven to 170 C or gas mark 3. Spread the marmalade on the cooked pastry base and carefully pour over the custard. Bake until the egg mixture is set with just a slight wobble. Leave to cool down slightly before removing from the tart tin. There is no need to bake blind. Simply rest the pastry and trim as above. Spread the marmalade over the base of the uncooked pastry case and then carefully pour the cream mixture over the top. Slide the loose bottomed tart tin on the preheated baking sheet. Cook in the roasting oven for 15 minutes and then remove from the oven and slide the grid shelf on to the floor of the roasting oven. Return the baking tray with the tart on to the grid shelf and slide the plain ‘cold’ shelf over the tart. Continue cooking for another 25 minutes. Start the tart in your roasting oven to crisp the pastry and then transfer to the baking oven to finish cooking.